Go beyond your typical stay at Sheraton Suites Akron Cuyahoga Falls. You'll discover an endless array of popular destinations near our hotel including Falls River Square, The Natatorium and city of Akron. Our prime waterfront location means that you'll continually find yourself just steps from plenty of fishing opportunities on the Cuyahoga River. Whether you want to lift weights in our 24-hour fitness center or take a lap in the heated indoor pool, you'll never have to let a workout pass you by during your getaway. Once you've worked up an appetite, our on-site restaurant, Beau's on the River, is constantly serving a mouthwatering buffet, along with unparalleled views of the falls, from breakfast through dinner. Cap off your night in one of our spacious one- or two-bedroom suites featuring plush bedding, marble bathrooms, mini-refrigerators, flat-panel TVs and room service. 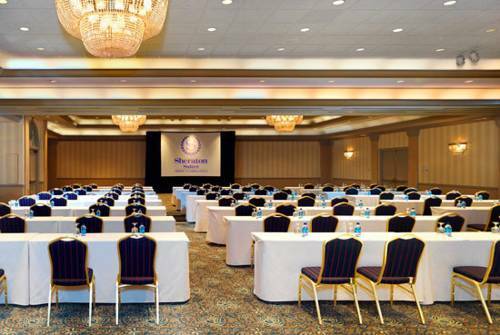 Experience the epitome of euphoria at Sheraton Suites Akron Cuyahoga Falls, a tranquil retreat where superb service is standard. Beau's on the River: Our signature restaurant offers a New American buffet paired with spectacular views of the Cuyahoga River rapids. Order from the menu and enjoy everything from fresh grilled salmon to a juicy filet mignon with a glass of wine or signature cocktail.